Looking for lunch recipes for kids? Try these fun and easy shish kebab sandwiches for lunch. Getting your child to eat healthy is not always an easy thing to do. There are lunch recipes for kids that are both healthy and fun. Making lunch time fun is half of the battle in getting them to eat properly. A healthy lunch will have protein to fill them up, carbohydrates to give them energy, and fiber. It is also important that lunch recipes for kids are low in saturated fat and free of artificial ingredients as much as possible. Healthy lunch recipes for kids provide a balanced meal that is filling and fun to eat. Drinks can include water, low-fat milk or 100% fruit juices. Each lunch should provide a good mix of the different food groups. Meals that are colorful are often more fun to eat and more attractive to children. Avoid things with extra, added sugar like juice drinks, dipping sauces, and pre-packaged snack foods. These shish kebab sandwiches can be created using the healthy foods that your child enjoys eating. You can also change the ingredients based on the produce that is in season in your area. Instead of fresh strawberries, you could substitute apple, banana, peaches or even cucumber slices. My children enjoy ham, however, if you are watching the fat intake for your child, low-fat turkey is a good alternative as well. Wash the strawberries and hull them. Remove the crust from the bread before you cut it. 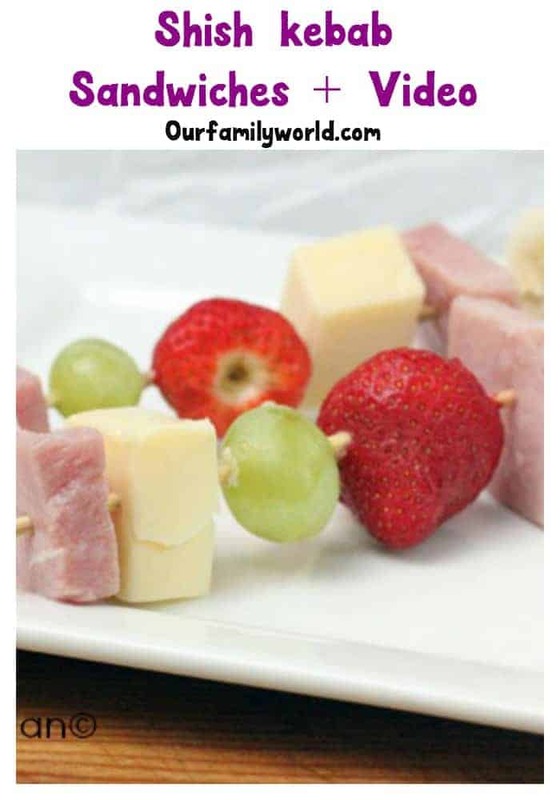 Using a shish kebab skewer, push the skewer through the ham, the cheese, the bread, grapes and fresh strawberries. You can make these ahead of time and store them in the refrigerator in covered containers. 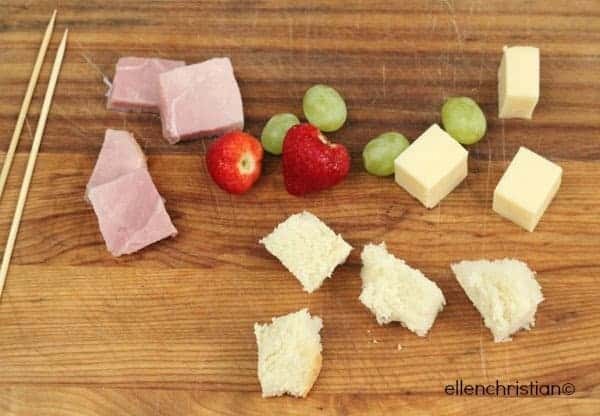 If your child is not going to eat lunch immediately, do not add the bread squares. Add the bread squares at the end of the skewer right before they are going to have lunch so that the bread stays fresh and does not get stale. What are your favorite lunch recipes for kids? Have you ever tried making shish kebab sandwiches for back to school time? Looking for more great lunch recipes for kids that step outside the usual sandwich? Check out these Ham and Cheese Pinwheels! Shish kebob is so much fun to eat at any age! Such a fun idea to keep back to school time interesting. I’ll do anything to get my kid to eat. LOL. Thanks for sharing at the Home Matters Party! This is a wonderful way to get kids to eat health lunches. I need to try this method. What a great idea. They are so pretty and I’m sure the kids will love this. This looks so fun to eat! My kids would love a lunch like this, this summer! We would try this, but I don’t think I’d be able to get mac-n-cheese on the stick! This is a really cute idea for a yummy lunch the kids will really have a lot of fun with. I never thought of presenting a sandwich this way. Love it! Hi Ellen! Just stopping by to let you know that I will be featuring this at tomorrow’s All My Bloggy Friends 🙂 Thanks so much for linking up! This is actually a perfect idea for my daughter! I make her sandwiches but she ends up tearing them apart and eating each thing separate, thanks for the great idea! Very cute too! We have never done this before but usually just put a bunch of fruit, cheese, meat and crackers on a plate and call it a meal! These are a great idea. I will be following your site closely as I try to find some easy meals to prepare my toddler. He isn’t picky but I want to make new things so that I am not always serving the same boring meals. Feeding Tips for Growing Babies – Mealtime Magic!